NOTE: if you visit the Old West Memorabilia section of this Web-Site, you will see " Peaches" the famous Apache Scout is wearing this same Model of Merwin, orange grips and finish !! 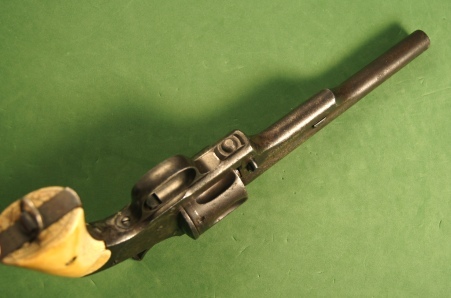 1st MODEL ARMY, 2nd VARIATION, .44MH Cal. 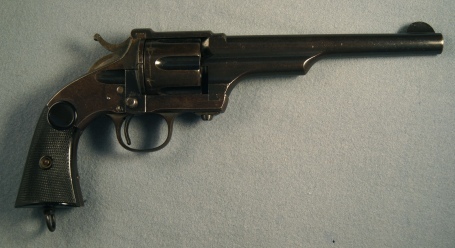 This Merwin, Hulbert & Co. revolver is right on the cusp of the 1st, 1st Army and having the design change to the 1st, 2nd variation. Serial No. 1131X has all the early features: Scoop Flutes, Single Action, Barrel Wedge, BUT it has the new 2nd variation feature of ONLY 1 trigger screw on frame. Also, this one is still in the .44 MH caliber. It has the 7 inch barrel, and has original factory Ivory Grips. The original finish was nickel plate, and it has about 3% remaining on protected areas. The overall finish is a plum/gray undisturbed and original patina. The Merwin really looks great with the original Ivory grips, which have a perfect 143 year old patina and color. Most IMPORTANT: are the mechanics of a Merwin revolver. This has perfect functioning working actions. The unique twist & pull extraction system works flawlessly, and the cocking and locking action is tight and crisp. Each time the hammer is pulled to the rear, the cylinder rotates and indexes tightly into firing position. One of the enduring classics in collecting is the Merwin, Hulbert & Co. Pocket Army. 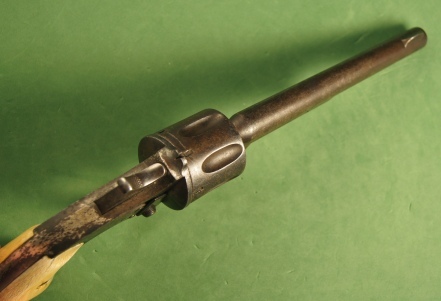 The 1st Model with the Scoop Flutes, Wedge in Barrel, and in Single Action 44/40, and the short barrel. 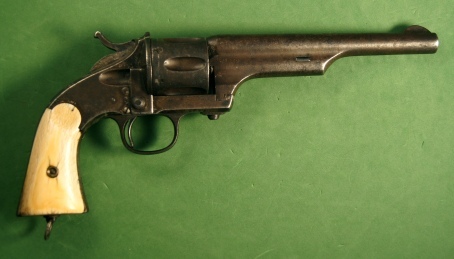 A quite Robust Revolver yet in that era capable of being carried in a pocket ! Serial No. 295X, has ALL matching assembly numbers of 2690. The Pocket Army has about 98%+ of all the factory original nickel plating, with only "pepper" spots on the frame. 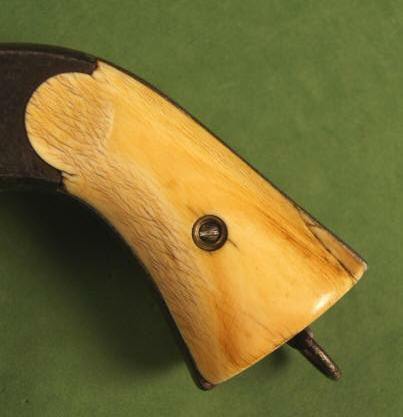 The trigger guard and hammer have their case hardening colors, only darkened. Most Important: the unique shell extraction system of the revolver functions 100% correctly! as do the actions of cocking and firing. It is a solid 100% mechanical revolver. 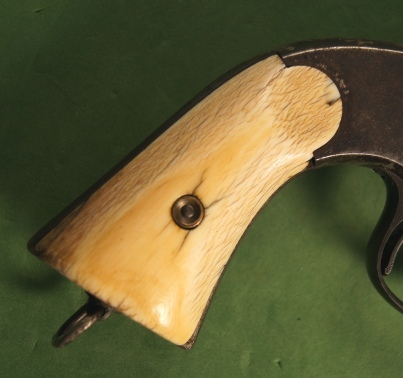 The stunning revolver is further enhanced by it's ORIGINAL Ivory grips, that have a perfect aged color and patina. This is a fine example of a classic Pocket Army from Merwin, Hulbert & Co. suitable for the most discriminating collection. 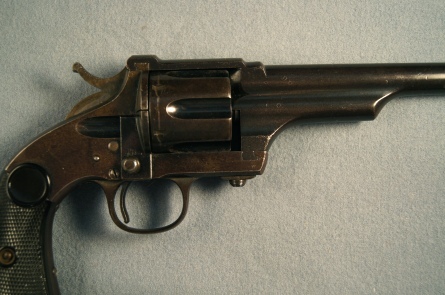 Of the ENTIRE production of ALL Merwin revolvers, including all calibers, all models, ONLY 2% were finished in the Blue. This is one of them, enough said as to rarity. Serial No. 1796X is a Single Action, with the Top Strap Frame, and has a blue finish. 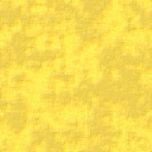 There is about 20% of the bright factory blue present, mostly in obscure areas and protected areas, like flutes etc. 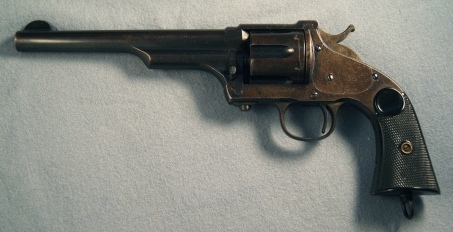 The balance is a dull blue, with underlying plum patina, which is correct and normal for a once blue revolver. It gives a very strong blue appearance. 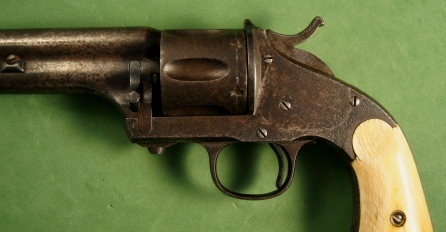 ALL assembly numbers of 8284 are matching, and ALL parts are original to the revolver. ALL factory applied markings are strong and clear. Most Important: ALL mechanical operations work 100% correctly all the time, opening and closing the unique twist& pull ejection system, as well as cocking, indexing, and locking tight to fire. 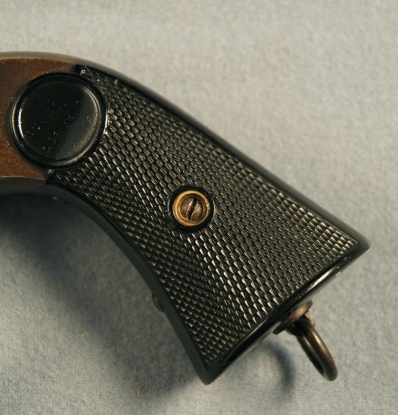 There are still case colors on the hammer and trigger guard. The checkered hard rubber grips are in superb condition, sharp checkering not any visible hand wear, and NO damage. A blued Merwin is incredibly difficult for the collector to locate, and in all factory original condition. A solid revolver for the collection !